Fear the Dental Needle No More! Unfortunately, “fear of the needle” sometimes precludes patients from dental examinations, cleanings, and other necessary treatments. This fear in most cases is developed from hear-say, cartoons, comedians, friends, and even family. A person is not born to fear the needle. This fear is developed unnecessarily and can be a detriment to the well-being of the patient. This does not only involve dental injections but also other types of medical injections. Parents should not discuss injections with their children as they invariably use the word “needle” or “hurt” or “pain.” This alone is a disservice to the child and makes the visit more difficult for both the patient and the dentist. The dentist and his staff know the proper words to use and more importantly, what words not to use. Remember that between 200,000 and 300,000 injections are given by dentists during his dental career. The dentist is also very much aware of the patient’s concerns about injections and he is quite good at it. Once a painless injection is given, a bond and trust is developed between the dentist and patient which opens the window for further treatment. All dental injections can be given with complete absence of discomfort, so let’s discuss some techniques that create this reality. The dentist must be able to give the injection with one hand; therefore, a rather large “holder” for the small needle and carpule of anesthetic is necessary so that the dentist can use one hand for access and the other for the injection. The large ring on the end of the appliance is used to aspirate by drawing back on the plunger with the thumb so as not to inject into a blood vessel. The needle and holder should always be kept out of the patient’s field of vision. The carpule, which is the small vial of anesthetic, should always be warmed to body temperature (98.6 degrees), as room temperature anesthetic (72 degrees), or anesthetic from the refrigerator (42 degrees), will cause cells or blood vessels to go into spasm resulting in discomfort. The carpule may be brought up to body temperature by a warming device or by rolling in the assistant or dentist’s hand for a couple of minutes. This procedure alone goes a long way towards a discomfort-free injection. In most cases, the tissue is dried by gauze and topical anesthetic, usually benzocaine, is applied superficially at the injection site to numb the surface tissue prior to the injection. The topical anesthetic should be in place a minute or so. After that time, the tissue should be quickly pulled onto the needle to penetrate the surface and then the tissue is shaken to distract the patient. This method works quite well. The actual needle should be small in diameter ( 25, 27, or 30 gauge), beveled, sharp, and disposable. As this needle is advanced very slowly into the desired area, a small amount of anesthetic is expressed in front of the needle so as to numb the pathway. This alone can eliminate the possibility of discomfort. A combination of all the above techniques will create an atmosphere of trust and relaxation for the patient. Once the patient knows that they can receive a pain-free injection, their fear of the needle slowly dissipates, and quite honestly, they will stop passing this fear down to their family and friends, and they also find that their dental visit becomes much more pleasant. They usually begin to brag about their dentist and tend to become “patients for life.” They find it great to tell their friends that they felt nothing during the injection. The local anesthetic itself is often referred to as novacaine. This was the original but is no longer used. Most commonly, lidocaine is used, and for shorter times of numbness, mepivacaine, and for longer numbness, marcaine. A vasoconstrictor is often part of the anesthetic so as to keep the anesthetic localized and lasting longer. There are two basic types of injections. 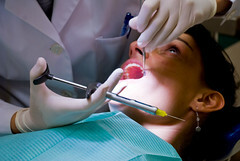 One is infusion where the anesthetic is slowly absorbed by the tissue, primarily used individually on the upper teeth. The other is the block, which numbs all the teeth on one side by injecting in one place, primarily used on the lower teeth. On occasion, a palatal injection on the roof of the mouth is necessary. This presents a different challenge to the dentist as the tissue is tight and dense. Usually only one or two drops of anesthetic is necessary and the tissue is reluctant to absorb the fluid. The injection may be easily given by first adding topical anesthetic, and then placing a blunt instrument at the injection sight and applying pressure. The needle is inserted only to a tiny depth while the instrument is removed. One or two drops is injected and it can easily be done effortlessly and painlessly. The phrase “fear of the needle” is unfortunately real, but use of proper injection techniques truly eliminates this fear and creates a “love of my dentist” situation.